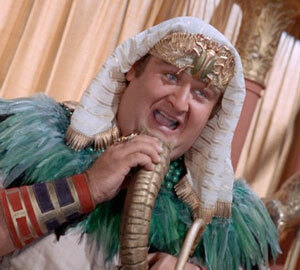 Victor Buono as King Tut is perhaps the most divisive villain among Bat-fans: some call him a genius, others roll their eyes whenever he appears. What is it that makes him more/less fun than the Joker or the Penguin? In this episode, having just watched "The Curse of Tut" and "The Pharaoh's in a Rut", we discuss this question and others: Why are there so many dummies in this episode? (Bruce certainly acts like one in the museum scene...) What happened to the Batmobile's security functions? Who the freak are “old Mo” and “the Hot Squad”?? And of course we discuss sexism, police ineptitude, and Nelson Riddle's score, including the return of... the Batusi!